From Manual of Mythology, by Alexander S. Murray; Revised Edition, Philadelphia: David McKay, Publisher, 1895; pp. 67-73. Fig. 8. — Poseidon, or Neptune. GENEALOGICAL TABLE. — No. 3. It may have been to illustrate a tendency of the sea to encroach in many places on the coast as well as to show the importance attached to a good supply of water, that the myth originated which tells us of the dispute between Poseidon and Athenē for the sovereignty of the soil of Attica. To settle the dispute, it was agreed by the gods that whichever of the two should perform the greatest wonder, and at the same time confer the most useful gift on the land, should be entitled to rule over it. With a stroke of his trident Poseidon caused a brackish spring to well up on the Acropolis of Athens, a rock 400 feet high, and previously altogether without water. But Athene in her turn caused the first olive tree to grow from the same bare rock, and, since that was deemed the greatest benefit that could be bestowed, obtained for all time sovereignty f the land, which Poseidon thereupon spitefully inundated. A similar dispute, and ending also unfavorably for him, was that which he had with Hera concerning the district of Argos. But in this case his indignation took the opposite course of causing a perpetual drought. Other incidents of the same nature were his disputes, with Helios for the possession of Corinth, with Zeus for Ægina, with Dionysus for Naxos, and with Apollo for Delphi. The most obvious illustrations, however, of the encroaching tendency of the sea are the monsters which Poseidon sent to lay waste coast 70 lands, such as those which Hesíonē and Andromeda were offered to appease. In the Iliad, Poseidon appears only in his capacity of ruler of the sea, inhabiting a brilliant palace in its depths, traversing its surface in a chariot, or stirring the powerful billows till the earth shakes as they crash upon the shore. This limitation of his functions, though possibly to be accounted for by the nature of the poem, is remarkable for this reason, that among the earliest myths associated with his worship are those in which he is represented in connection with well-watered plains and valleys. In the neighborhood of Lerna, in the parched district of Argos, he had struck the earth with his trident, and caused three springs to well up for love of Amymonē, whom he found in distress because she could not obtain the water which hre father Danaus had sent her to fetch. In Thessaly a stroke of his trident had broken through the high mountains, which formerly shut in the whole country and caused it to be frequently flooded with water. By that stroke he formed the pleasant vale of Tempē, through which the water collecting from the hills might flow away. A district well supplied with water was favorable to pasture and the rearing of horses, and in this way the horse came to be doubly his symbol, as god of the water of the sea and that on the land. In Arcadia, with its mountainous land and fine streams and valleys, he was worshipped side by side with Demeter, with whom, it was believed, he begat that winged and wonderfully fleet horse Arion. In Bœotia, where he was also worshipped, the mother of Arion was said to have been Erinys, to whom he had appeared in the form of a horse. With Medusa he became the father of the winged horse Pegasus, which was watered at springs by Nymphs, and appeared to poets as the symbol of poetic inspiration. And again, as an instance of his double capacity as god of the sea and pasture streams, the ram with the golden 71 fleece for which the Argonauts sailed was said to have been his offspring by Theophanē, who had been changed into a lamb. Chief among his other offspring were, on the one hand, the giant Antæus;, who derived from his mother Earth a strength which made him invincible, till Heracles lifting him in the air overpowered him, and the Cyclops, Polyphemus; on the other hand, Pelias, who sent out the Argonauts, and Neleus the father of Nestor. To return to the instances of rebellious conduct on the part of Poseidon, it appears that after the conclusion of the war with the Giants a disagreement arose between him and Zeus, the result of which was that Poseidon was suspended for the period of a year from the control of the sea, and was further obliged during that time, with Apollo, to help Laomedon in building the walls of Troy. Some say that the building of the walls was voluntary on the part of both gods, and was doe to test the character of Laomedon, who afterwards refused to give Poseidon the reward agreed upon. Angry at this, the god devastated the land by a flood, and sent a sea-monster, to appease which Laomedon was driven to offer his daughter Hesionē as a sacrifice. Heracles, however, set the maiden free and slew the monster. Thus defeated, Poseidon relented none of his indignation towards the Trojans, and would have done them much injury in after times, when they were at war with the Greeks, but for the interference of Zeus. Though worshipped generally throughout Greece, it was in the seaport towns that the most remarkable zeal was displayed to obtain his favor. Temples in his honor, sanctuaries, and public rejoicings were to be met with in Thessaly, Bœotia, Arcadia, at Ægæ, and Helice, on the coast of Achæa, at Pylos in Messenia, at Elis in the island of Samos, at Corinth, Nauplia, Trœzen, in the islands of Calauria, Eubœa, Scyros, and Tenos, at Mycale, Tænarum, Athens, and on the Isthmus 72 — that belt of land which connects Peloponnesus with the rest of Greece. In the island of Tenos an annual festival was held in his honor, at which he was worshipped in the character of a physician. People crowded to the festival from neighboring islands, and spent the time in banquets, sacrifice, and common counsel. But chief of all the gatherings In his honor was that held on the Isthmus of Corinth in the autumn, twice in each Olympiad — a festival which had been established by Theseus, and in reputation stood next to the Olympian games, like them also serving the purpose of maintaining among the Greeks of distant regions the consciousness of their common origin. The Corinthians had the right of arranging and managing them, but the Athenians also had certain privileges. 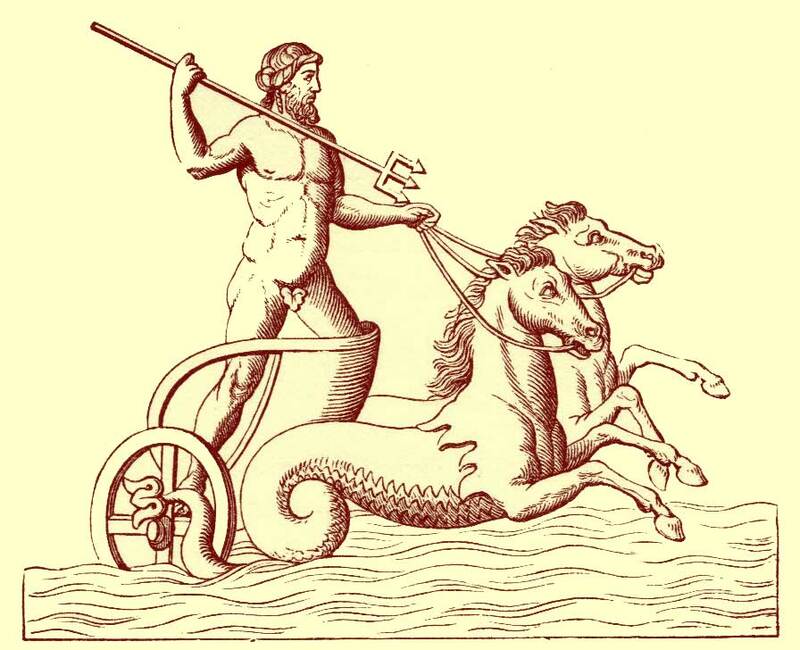 It was in his double capacity of ruler of the sea and as the first to train and employ horses that the honors of this festival were paid to Poseidon. His temple, with other sanctuaries, stood in a pine grove, a wreath from which was the prize awarded to the victors. The prize had originally been a wreath of parsley. In this sacred pine grove was to be seen the Argo, the ship of the Argonauts, dedicated to Poseidon as a memorial of the earliest enterprise at sea; and there also stood the colossal bronze statue of the god, which the Greeks raised to commemorate the splendid naval victory gained over the Persians at Salamis. Horses and bulls were sacrificed to him, the method of performing the sacrifice being to throw them into the sea. It was the practice of fortunate survivors of shipwreck to hang up some memento of their safety in one of his temples. The Romans, living mostly as herdsmen and farmers in early times, had little occasion to propitiate the god of the sea, and it was, probably, therefore, rather as the father of streams that hey erected a temple to Neptunus in the Campus Martius, and held in his honor a festival which was 73 attended with games, feasting, and enjoyment like that of a fair. Between Zeus and Poseidon there is, in works of art, such likeness as would be expected between two brothers. But Poseidon is by far the more powerful of the two physically — his build, like that of Hercules, expressing the greatest conceivable strength. But unlike Hercules, his attitudes, and especially his head, are those of a god, not of an athlete. His features, one by one, resemble those of Zeus, but his hair, Instead of springing from his brow, falls in thick masses over his temples, and is matted from the water. His attributes are a trident and dolphin. Possibly the sacred figures of him in his temples represented him seated on a throne, and clad in the Ionian chiton. But in the colossal statues of him erected on promontories and in harbors to secure his favor, he was always represented standing, and wearing only a slight scarf which concealed none of his powerful form, holding out a dolphin in his left and the trident in his right hand, often with one foot raised on the prow of a vessel. In works of art not connected directly with his worship he was figured, as in Fig. 8, traversing the sea in a car drawn by Hippocamps, or other fabulous creatures of the sea. In one of the pediments of the Parthenon the dispute between him and Athene was represented.